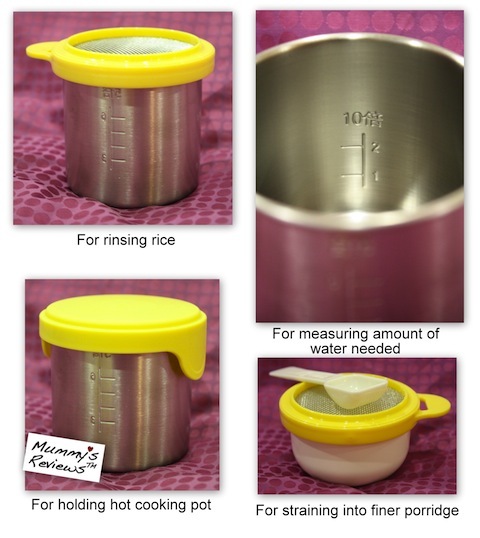 Here’s a review on the Pigeon Porridge Cooking Pot, provided by Pigeon (Malaysia). 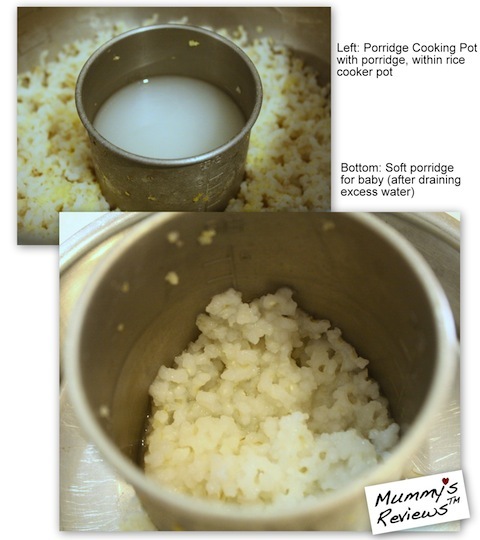 It provides an easy way to cook baby porridge with the family’s rice within the same rice cooker pot. 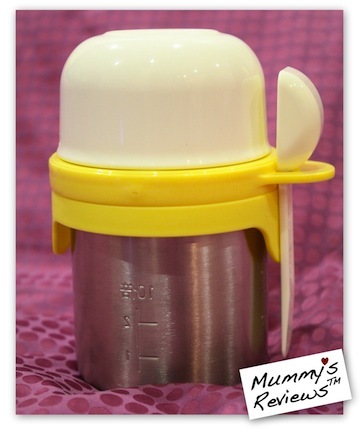 An excellent kitchen tool for the busy mummy with a weaning baby! During a baby fair some time back, I’ve already been interested in this Porridge Cooking Pot. So when Pigeon Malaysia approached me for a review, I selected this item. I like how all the parts stack up neatly together when not in use. The accessories are well-thought out to cover every process of preparing baby’s porridge — from rinsing the rice, measuring the rice and water, removing the hot pot, to straining the porridge. There’s a clear instruction sheet on how to use the set, including the amount of water needed for various weaning stages. For instance, a baby who just started eating porridge may use the x10 measurements, which means 10 times of water to the amount of rice. Later on, you may reduce the proportion to x7 then x5 for porridge that’s like sticky rice. (a) Ease of Use: ★★★★ The review shall go step by step: The spoon helps me measure the correct amount of rice easily. For each of Jae’s meal, he needs 2 spoonfuls of rice or multi-grains. The pot with strainer is great for washing that little bit of rice. The measurements on the Porridge Cooking Pot are meant for white rice. Since I use brown rice and multi-grains at home, the x5/7/10 measurements aren’t relevant to me. Still, I tried it out with white rice during a vacation at my mum’s place in Singapore. It’s very easy to use, my mum got the hang of it after only one try. Using x7 resulted in rather sticky porridge, Jae prefers x10. The basic idea is to put the Porridge Cooking Pot (to cook porridge) in the centre of the rice cooker pot (to cook rice). After the rice is cooked, leave it to settle for 15 minutes. Tadaa… there you get baby porridge and rice in the same rice cooker. No need to cook baby porridge separately. This is very suitable for mums who cook every day — that’s exactly my mum! Back in Malaysia, I experimented it with brown rice. I took several tries to get the amount of water just right. The final solution: 1 spoonful of brown rice to 1/3 cup of water. The first picture below shows my Porridge Cooking Pot within the family’s rice. The next picture shows the soft porridge, just nice for a baby. Any excess porridge water can be fed to baby or an older child too, so I prefer to use more water for cooking porridge. Baby Jae LOVES to drink porridge water. (b) Other Use: ★★★★★ Recently, I started introducing organic goat’s milk formula to Jae. Because we don’t use milk bottles (both plastic and glass), I decided to mix the milk powder and water in this stainless steel pot. The pot has measurement lines for my reference, so it’s very convenient. After that, I pour the milk into Jae’s cereals. If he’s in the mood, he drinks straight from the pot too. Ha, very multi-purpose! (c) Quality: ★★★★ The Porridge Cooking Pot and accessories are very well-made, as expected of “made in Japan” products. I need to use it many more times to judge the long-term quality. I’d prefer it if the bowl were made of stainless steel too. (d) Overall Value: ★★★ Each Pigeon Porridge Cooking Pot retails at RM99.90. In Singapore, I read somewhere that it’s SGD29.90. So far, I don’t see any similar product in the market. As an alternatiive, you may D-I-Y by getting a stainless steel container and recording down your own rice-to-water proportions somewhere. The Pigeon Porridge Cooking Pot is a convenient kitchen tool for the busy Mummy who often needs to cook baby porridge and family rice. I love using it as a stainless steel measuring cup too. Indicate type of plastic used for spoon and bowl. Preferably, use stainless steel material for all parts. To get your own Porridge Cooking Pot and other Pigeon products, visit Pigeon (Malaysia) or Pigeon (Singapore). These cooking pots are imported from Japan in limited quantities, so get them while stocks last. P.S. Read more tips and reviews on weaning baby to solid foods. Disclosure: I received a Porridge Cooking Pot and 3 packs of Liquid Cleanser Refill from Pigeon (Malaysia) for review and use. Pigeon (Malaysia) will also be invoiced SGD15 to cover newsletter software subscription costs. Long time ( from me too). Thanks for this review, I was going to buy a rice cooker this WE. This looks good and if it really is sgd29.90 I will pick it up asap. I checked it out on their website but can’t find the retailers, guess will call up the nearest Isetan and find out. May I ask at what age Jae went from tinned cereal to regular rice ( porridge)? Hi Manorama, Jae started cereal at about 5.5-6 months. About 1-2 months later, porridge. Now, he still takes cereal during breakfast, for a bit of variety. As for rice cooker, I’ve been using the Buffalo Smart Cooker (since Vee’s weaning days 3+ years back), a rare brand with stainless steel inner pot, instead of aluminum or a coated one. May also buy only the inner pot to replace that from another rice cooker. The “smart” part is the timer function that allows me to preset when the porridge (or food) should be ready. So in the morning, I’d fill the cooker with ingredients, set the time, then do stuff with the kids. By the set time, the food is ready. It also serves as a steamer. I usually cook in bulk, to freeze and store too. Its higher price than regular rice cooker but I love it. Available at Takashimaya kitchen appliances section and Song Cho. Ok great thanks for the reference, I will look for it as well. I have totally banned aluminium and non stick from the kitchen except for an Ikea frying pan and some other vessels which don’t come into direct contact with food. So stainless steel rice cooker pot sounds excellent. I have several stainless steel pressure cookers of varying sizes so if the baby pot fits into one of those, good enough. Can you use this pot to steam vegetables? Following the same process of putting it in the rice cooker? Oh dear, sorry for missing your comment. Yes, same process. It’s really a small cup though. Hi jeanny, apology for overdue reply. The metal cup works like a mini pot, so you may add carrots / pototoes / etc that take about the same time as porridge to cook.